Long hair is supposed to be a thing of beauty, not a plumbing hazard. But the truth is that even the loveliest of locks can cause drains to clog. Just ask Jennifer and Gifford Briggs, proud parents of five daughters with long blonde hair and the inventors of DrainWig—a clever solution for preventing hair from wreaking havoc on your drain pipes. The Briggs credit a piece of dental floss that went down the drain for inspiring their invention. When they managed to pull out the floss, a big clump of hair came with it. Take a look at any drain pipe and you’ll see what the Briggs saw—it has a curve. That curve is where the hair collects and gets stuck. DrainWig is a ball chain with several rubber whiskers that catch the loose hair before it has a chance to reach the curve of your pipe and cause buildup. 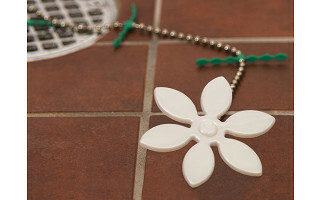 Just feed DrainWig down your tub or shower drain and retrieve it a few months later by pulling the white plastic flower. Designed to be simple to replace every three months, DrainWig is a small price to pay compared to plumbers and harsh chemicals that treat the problem, but don’t prevent it from happening again and again. 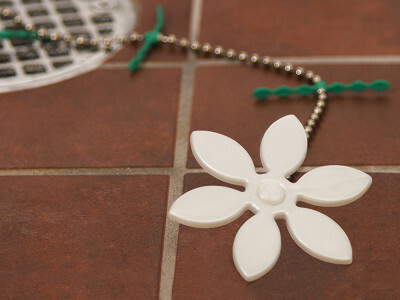 With DrainWig, you can let your hair go down the drain without watching your money go with it. Shout out to all you Grommet fans out there. Words cannot express how excited I am to launch the DrainWig on The Grommet. 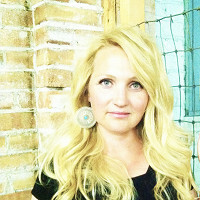 I am a stay-at-home mom and never thought that I could do something like this. I am grateful to my five daughters who made the development of the DrainWig possible. Let us all stop throwing chemicals down the drain and save ourselves the unpleasant task of cleaning out the shower drain. Think of a life where you don’t have to call a plumber, you don’t get stuck with the awful task of cleaning the shower drain on a weekend, no more special trips to the store for rubber gloves, and best of all…… no more dry heaving due to your weak gag reflux! You all know what I’m talking about…… Nobody's Got Time For That! What a great idea! A lovely alternative to those scary chemicals! Thank you for your comment! I agree, we used to have to leave the house when we used chemicals to clean our drains because of my daughters allergies. Now because of the DrainWig we don't have to! This should work really well. Not long ago our bathroom sink was clogged so I reached into the drain pipe an inch and there was an elastic hair band stuck there. When I pulled it up, you wouldn't believe the hair that was caught on it! And no more clogged drain! We have a shower/tub combo with a different type of drain/stopper. Would this work on that as well? Would love to try it out as I am disgusted every time I have to unclog my hair from the drain! Long hair is supposed to be a thing of beauty, not a plumbing hazard. But the truth is that even the loveliest of locks can cause drains to clog. Just ask Jennifer and Gifford Briggs, proud parents of five daughters with long blonde hair and the inventors of DrainWig—a clever solution for preventing hair from wreaking havoc on your drain pipes. The Briggs credit a piece of dental floss that went down the drain for inspiring their invention. When they managed to pull out the floss, a big clump of hair came with it. Take a look at any drain pipe and you’ll see what the Briggs saw—it has a curve. That curve is where the hair collects and gets stuck. DrainWig is a ball chain with several rubber whiskers that catch the loose hair before it has a chance to reach the curve of your pipe and cause buildup.